is so famous on Pinterest right now! I definitely wanted to make one of these things, but I didn't want to leave my readers out of all the fun. So, I've decided to make this tutorial explaining how I created my own interpretation of the bottle cap wind chime. Let's get started, shall we? this re purposed coffee can. To make a moderately sized wind chime you will need to collect at least 40 to 50 caps. My wind chime ended up with over 70 caps in all. The exact amount will vary depending on how big you want your finished product to be. But heck, even if you run out of caps there are plenty of ways to improvise. Personally, I happen to have a good connection when it comes to bottle caps supply- Many of my friends and family are beer enthusiasts that provide a steady stream of interesting caps. It doesn't take long to collect enough bottle caps for your wind chime. I easy accumulated enough to fill the entire container within a month or so. Metal Wire- You need this to link your bottle caps together. I used a thick aluminum 10 gauged wire, but you can also use thin 24 gauge (or any other size of you like.) You can pick this stuff up at any craft store or even Wal-Mart. Some wind chimes utilized circular metal hoops, like the ones used in jewelry making, but I found that wire was a lot cheaper and simpler to work with. By the way, you will also need some pliers and wire cutters (or scissors.) Don't ruin your hands by trying to manually bend the wires! These tools will make your life easier, trust me. Center Piece- This will be your base that you attach all your bottle cap links to. It just needs to be a sturdy and intriguing item. I encourage you to use a recycled found object! These random pieces of "junk" can end up being the perfect fit for your wind chime. Some great examples of center pieces include a vegetable steamer, An old CD, tree branch, tin cans, metal strainer, or like in my case, some salvaged gears from my old bicycle. Piercing Tool- Something to put holes in your bottle caps. The best options I found were either a hammer and punch or an electric drill, but I'm sure there can be others methods that work as well. Use a hammer and punch or a drill with a small bit, depending on your preference and availability. I'm going to assume that you already basically know how to use the hole punching tools, or know someone who does. It's pretty simple- lay the bottle cap flat face down on a piece of scrap wood (NOT your mom's favorite table!) and drill or punch the hole in near the edge of the cap. Once all your bottle caps have holes in them, it's time to make the chains. Take your wire and cut a moderately short length. How much wire exactly is up to you, depending on how long you'd like each chain link to be. For the record, my wires were cut probably around 2-1/2 inches long. In my opinion, it's easiest to just eyeball it and adjust the chain links until you find a length that's pleasing to you. After you find a good chain link size, go ahead and cut out a few extra wire pieces- you'll need them. Hook the length of wire through the bottle cap's hole. Leave one end with a long "tail." You'll be using this extra wire to attach the second bottle cap. Wrap the length of wire around itself. Tightly secure the wrapped wire. Use pliers to press the loop closed so the bottle cap will not fall off. One bottle cap hooked on. Now, repeat this process with the remaining length of wire and another bottle cap. One bottle cap chain link complete! six or seven bottle caps for each chain. This step may vary a little depending on what you used as your center piece. You will have to find a way to hook the centerpiece and the chains together with the wire. In some cases, like this particular project, it's fairly easy to wrap the wire around the base. Unlike my last wind chime project, where I had to drill holes into my center piece in order to attach the chains. To hang my wind chime I made a weaving out of fishing wire around the bike gear and tied it off at the end. Simple, quick and effective. A piece of fishing line or regular wire would work, too. All of the chains finally attached to the center piece. My wind chime is now complete! The metal disks I used on the bottom of my wind chime are from cans of dough. I love the rusty patina they're developing after being exposed to the outdoors. A few random found object additions to your bottle cap wind chime can really create a nice embellishment. Plus, your bottle caps will make more sounds when they bump up against these items. If you want your wind chime to look "fuller,"
down the middle to make it look more dense. back and add additional chains one day soon. Serving up bottle cap realness. If you end up using this tutorial for help, I wanna see your finished wind chimes! And as always, if you have any questions at all about this subject, by all means leave me a comment. Started collecting and am going to create one of these. Thank you for the tutorial and 'bravo' for all your ideas!! I will be following your blog from now on and haven't ever followed one before! Aww shucks! Thank you for the kind words chekoya :) I am honored to be your first blog follow! I hope to see pics of the results when you complete your windchime. Good luck and happy craftin! Hi Trina, I've had your awesome wind chimes pinned for a few months now and decided that I'm going to make it for The Pinterest Challenge. Thanks so much for the inspiration! I'll be checking in on your blog to see the updates!! Keep in touch. thanks for this idea for wind chimes, Trina. I also make wind chimes out of old utensils,bottle openers, just about anything that makes nose. I'll post some pictures of the wind chimes I've made. Can't wait to make this one. Thanks again. Oooo neat, definitely drop off some pics of your wind chimes. I find looking at other people's work very inspiring. Definitely send me a pic of your bottlecap one when it's complete, I'll add it to my post! Loved it! I have taken the liberty of posting this on Facebook – http://www.facebook.com/thelittlegreenpage – an online community to spread eco-awareness. Trust this is fine with you. Thanks! Super cool! Working on a sensory garden for my son who has autism and we will TOTALLY be making this together! How would you describe the noise it makes? I had imagined using the bottle caps with some other found objects they might strike against for sound, but yours are so lovely maybe we don't need to . . .
Just a suggestion. 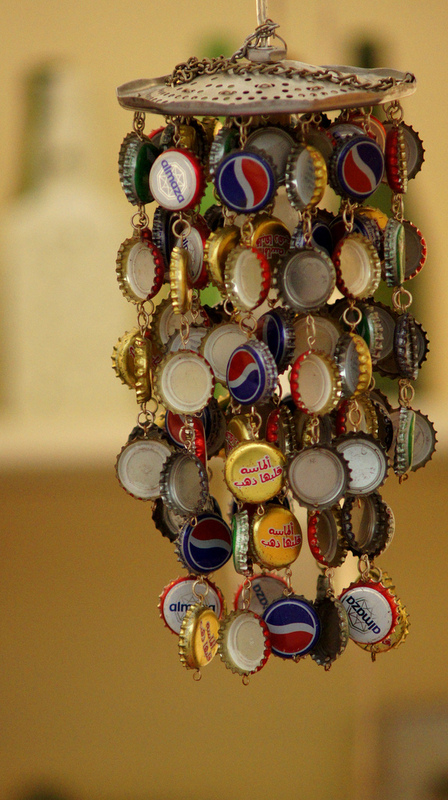 I have made an awesome bottle top chime. String together strips of caps using some good quality high breaking strain fishing twine. Interlace the cap strips with varying lengths of thin gauge open ended stainless steel tubing, also mounted with the same twine. In the wind the caps make an awesome noise on the tubing, a very chaotic musical ensemble. Try varying the tube thickness and length for different notes. Whoa what a creative twist on this idea, Wolfman. I would really love to see some pictures of your piece! Or a Video?? What kind of sound does THAT wind chime make? :O I'm intrigued.. hope you get back to us on this! Saving my caps and patiently waiting to make this. Thank you for the tutorial. Thank you for the tutorial. Can't wait to make this. Love creating from found things. so I am not crazy after all! Thank you so much for your how to play with bottle caps tutorial, I have been trying to figure out how to for months now. I or my eyes don't care for the jump rings and trying to figure out spacing etc. so I said there has got to be an easier way! I found your site first on google and don't really need to look any more. Thank you for you time! I've got all my bottle caps and I'm super excited to make mine! I was wondering, did your bottle caps start to rust from being outside? If so is there anything you can spray or coat them with to keep them from rusting? I've been collecting bottle caps for a year. What a great idea! Love your blog BTW. PS Thanks Champaing for the kind word! 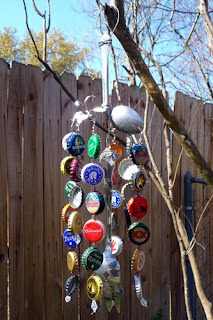 I found your blog via Pinterest, and had collected bottle caps for at least 6 months in order to make this wind chime. I finally got to make mine tonight! I'd love to share photos, just let me know how. If your wire is too long, try folding it in on itself.. I had that happen on a few of my links and I just kind of mashed the wire down until it was the length that the rest of the chains were. To secure the wire in this shorter position, use some pliers and twist the wire around itself a few times. It should stay in place if youre careful- the bottlecaps themselves are not heavy enough to weigh the wire back down. With your next wires that you cut, make sure to adjust them and make them shorter! Hope this helps. I started on mine a few weeks ago. I became such a big cap collector. My local bar set out a jar for me. I have enough to make 3 chimes now!! How fun! My son collects bottle caps and is looking for a project in which he can use them for 4-H. This is perfect! Thanks for sharing! may I ask how they sound in the wind? You totally inspired me! Now, between my family & friends I've been collecting beer & soda bottle caps since July. Many unique caps in the mix to add flair. I have almost 400! I have a lot of support for this cool project. Thanks for the inspiration! I can't wait to get started!! Now to get my friends to save all their bottle caps for me! Love this and I will be making one for my yard ~ close to my garden so I can enjoy it while I work! I recently saw your post and decided I needed one of my own. So I started gathering caps, but I didn't recurve a nice random assortment, or even all of the same kind. So I decided to paint my caps! With red, white, and blue rust protectant spray paint! I'm threading them as we speak! I have been saving bottle.caps for years with every ambition to make a wind chime.. I think I will.start soon!!! Cannot wait to try this. Better get to sippin' I guess. Thanks for sharing this! 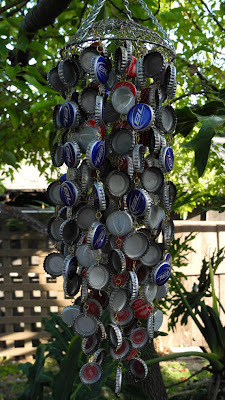 I have collected bottle caps for years and have made various things from them - going to do this windchime and use up a bunch. Looks easy enough to do and I have wire on hand. I love DIY'ing and also love using what's available and on hand to make something different and unique. Thank you for the clear instructions and photos - great blog ! Maybe some lacquer from a hardware store that you could lightly spray like how people weather proof the metal hardware for a porch or swingset. Just a thought. I can't wait to get started on this. I've got TONS of bottle caps thanks to my husband and brother in law. My hubby knows that I'm collecting them for a project--he just doesn't know what. I'll let ya'll in on it. 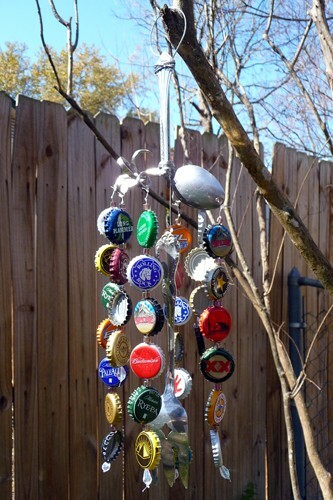 I'm going to make this bottle cap wind chime for his father's day present from me and our son. I think he'll get a kick out it! I've seen a few bottle caps chimes. I just didn't have know how to put them together. However, I did figure out something. How can I share a pic of it to you? I just saw this today. I am going to start collecting bottle caps now as well.